In the current headquarters of the Vicious Circle, FirePower is confronted in his office by his would-be successor, Dart. The ambitious young woman announces her intentions to rule the criminal group but her goals are mocked by FirePower. He points out a number of other villains that could easily eliminate her if they desired due to their long-range weaponry. FirePower then dismisses his rival’s short-range arsenal before attacking. He soon knocks the God Sword from the hands of Dart but she dodges his flame. Dart then throws two explosive darts with uncanny precision to impale both FirePower’s eyes, causing his head to explode. Dart then addresses numerous Vicious Circle members present and demands cooperation as the next phase of her plan will now commence. 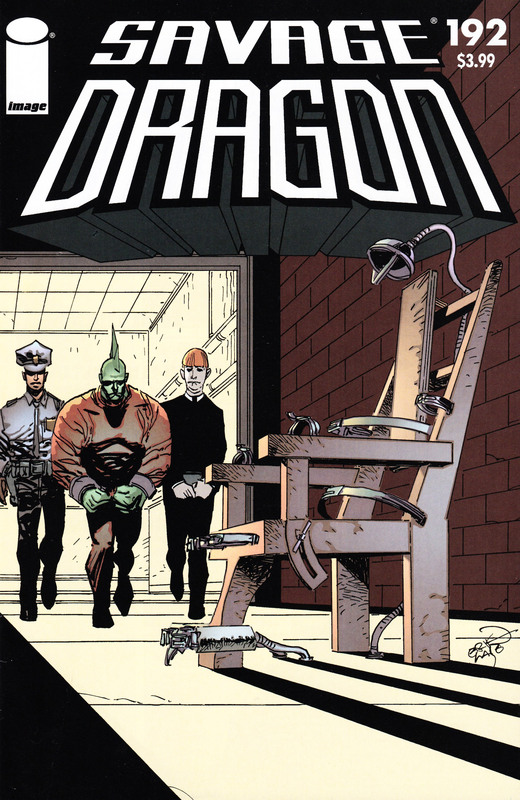 Meanwhile at Stronghold Penitentiary, Dragon is led by a guard toward a room where he is strapped in to what appears to be an electric chair. He is accompanied by Reverend Parasol who implores the hero to escape so as to avoid his impending execution. Dragon is accepting of his fate before the device is activated and he is engulfed in energy. Malcolm Dragon, Battle Girl and Lorella arrive in time to witness what appears to be the death of Dragon. Lorella then explains how over the past two decades that the Krylans had been working on a method to transform a Chosen One into a regular Krylan. This procedure was made necessary due to Emperor Kurr’s cruelty and the Krylans’ fear that his heir would prove equally dangerous. Dragon is now effectively a regular human, despite maintaining his signature green skin, fin and two toes on each foot. Dragon then demands that Parasol change the name of the Church of Savage Dragon to remove his own name from it or else he will pursue legal action. With his powers removed, Dragon is led away so that he can be transported to a different prison as he would be doomed should he stay in Stronghold. Parasol returns to his church where Helen Black offers him words of comfort. She suggests a change in name and Parasol comes up with the Brotherhood of the Fin. Malcolm and Angel head for something to eat whilst they wait for the cab that will take Angel to the airport back to Washington, DC. 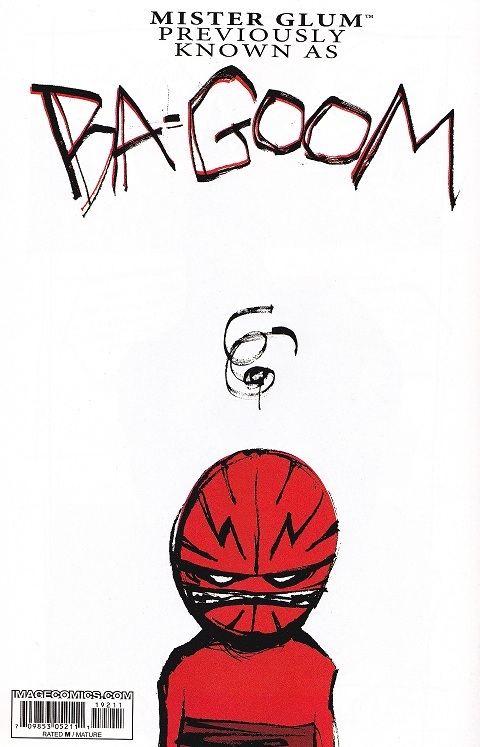 They discuss Dragon’s fate and whether or not he could ever be a crime-fighter again. Angel seems convinced it is possible whereas Malcolm has pretty much accepted that their father’s days as a hero are over. Their meal is interrupted by curious members of the media and as they leave the restaurant, Malcolm comes under attack. The now superhuman Brenda Funk makes her move against Malcolm, having been transformed into the monstrous form of Slag. She casts aside Angel as her assault on Malcolm continues but the young hero cannot bring himself to truly fight back. Malcolm tries to talk down the obviously upset villainess. Angel recovers and shatters the form of Slag with a pole and berates her brother for being too nice to his enemies. As Angel then heads off to the airport, Malcolm is left alone to deal with the reporters, unaware that Slag’s various pieces are slowly reforming. Meanwhile at his new prison, a group of inmates attempt to make a name for them by killing Dragon. They are all swiftly beaten down by Dragon to announce that even though he no longer possesses superhuman abilities, he still retains all of his previous fighting skills and knowledge. He warns off his fellow prisoners from attempting another such foolish attack before guards arrive to break things up. Dragon assures the guards that he was in no real danger. Several years ago in Dimension-X, the denizens of Glum World hear about the escape of the Savage Dragon from the clutches of Deathseed. They begin to celebrate this feat and declare that Dragon is the mightiest warrior in the entire Void. This claim enrages Glum World’s ruler as Ba-Goom fancies himself to be the greatest warrior in existence. His minions apologize for upsetting their ruler but were merely stating the obvious that Dragon is more powerful that even he. The people debate whether the reputation of Glum World would benefit if they began conquering worlds much bigger than their own. Ba-Goom takes this challenge seriously and decides to prove himself by defeating Dragon. He takes a personal teleportation device and departs for Earth to lay claim to his desired mantle. His people begin to celebrate their freedom from their merciless dictator before some doubt comes to mind.